When moving, you always hear about what you should be doing on moving day. You know that you need to be there to supervise the move, you know to stay hydrated, and you even know what items you need to carry in your own car with you instead of letting the movers handle this. However, what are some things that you are going to want to avoid doing? 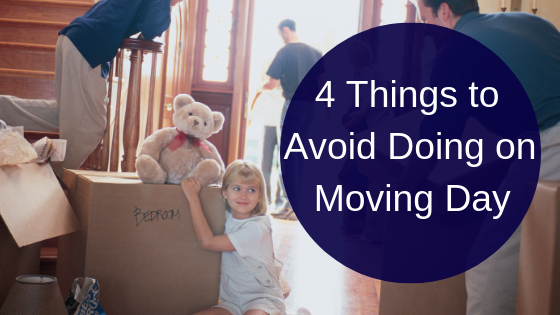 We have a list of 5 ways that you could be doing that is making your move day go even longer! Don’t ever go into a move thinking that you can get the professionals out of a home before the time that they estimated. These are estimates, and rarely do you find that a professional moving team underestimate their time. If they do, it may be an hour or two…not several. Too many times, people make the plan that the movers will be done in an hour tops and plan to have their home shown to potential buyers or they need to see their real estate agent to sign the closing documents. Always make certain that on moving day, you are not trying to rush the pros out the door…this is when mistakes are made. Moving is stressful…we totally get that. However, being rude is not going to make anyone work faster. In fact, it could make people work slower simply due to having to slow down in order to deal with this rudeness. Don’t be rude and try to hurry movers or tell them how to do their jobs. They are the professionals and they know what they are doing! While many professional movers are animal lovers themselves, this does not mean that they want to watch every step that they make to avoid stepping on the family pet. Never leave pets to roam the home while movers are going in and out…doing so is a good way to allow your beloved pet to escape the home and roam the neighborhood. Instead, have this animal stay outside, with a family or friend or even board this animal at the kennel for the day that movers are there. It can be tempting to get the movers into your home and then get the cleaning crew in right behind the movers. However, chances are you are not going to make these times line up. We suggest that you let the movers come in on moving day, and the next day you have the cleaners come to your home. Whatever you do, plan ahead and plan accordingly on moving day. You always want to focus on the move the day you are moving and not the other hundreds of things that may be on your list to do. Remember, the professionals at Quality Moving & Storage are here for your moving needs!